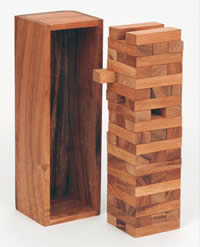 Play involves each player removing a block from somewhere in the tower, and putting it in a new position on top. The goal is to do this without knocking over the tower. Blocks are always removed from below the highest complete level, and the top level is always completed before a new level is started (at right angles, of course). Write a program which reads sequential moves of a Jenga game and determines at what point the tower (or any part of it) falls or topples. Note that a structure will topple if its center of gravity, projected onto its base, lies outside the convex hull of its support points. If the center of gravity lies exactly on the edge of this hull, we will assume that the structure is stable. The first line contains N, the number of moves. The next N lines describe one move per line, with two locations separated by a single space. The first is the location of the block to be removed, and the second is where it will be put back. A location is specified as a number, specifying the level, and then a letter A-C, specifying its position in the level (left to right or front to back). For instance, the top level of the initial tower configuration consists of blocks at 18A, 18B, and 18C. Below is a diagram of the pieces, labelled with a front and right side perspective. If the tower collapses after removing a block at location L, output "The tower collapses after removing L". If the tower collapses after placing a block at location L, output "The tower collapses after placing L". If all moves execute successfully (i.e., without causing the tower to fall), output "The tower never collapses". how are we suppose dto figure that out? Some simple logic goes a long way. bleung91 on Dec 28, 2008 - 2:40:10 am UTC support points? dAedaL on Dec 28, 2008 - 3:01:17 am UTC Re: support points? I have absolutely no idea and I solved it.